Michel Carré and the homonymous work (1808) de Johann Wolfgang von Goethe. Chorus and Orchestra holders RealHomúnculo Theater is defined as being with human characteristics, usually deformed and artificially created. It seems that was the alchemist Paracelsus who first used this term for a creature created when trying to find the philosopher's stone. Homunculus theory was accepted until 1827, year in which it was discovered the existence of the egg. 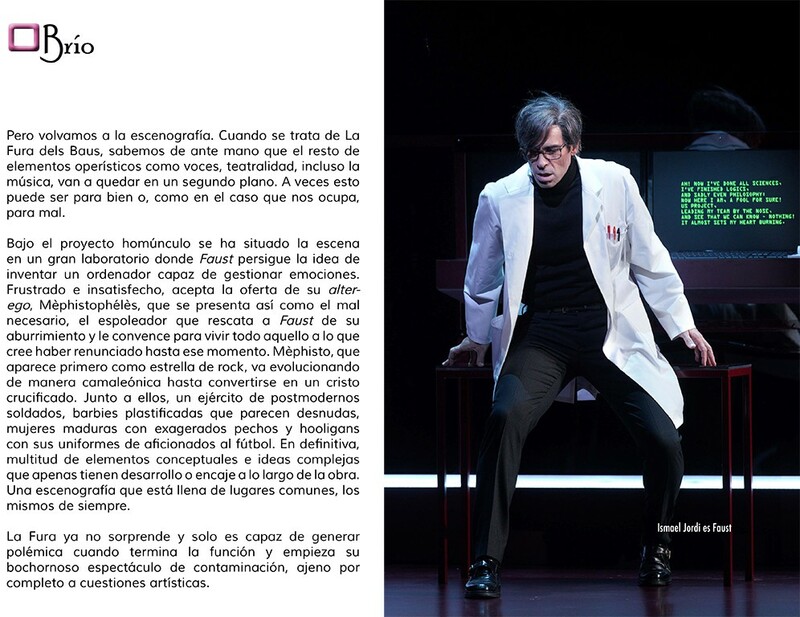 Until that moment, it was thought that the sperm hid a homunculus or miniature man for the egg only served alimento.El homunculus is also the element that has inspired to La Fura dels Baus, specifically its director Alex Ollé, to develop the scenery of Faust presents the Royal Theater at the premiere of his new temporada.Son several repertory operas that premiered with failure. But if there is one that takes the cake, definitely, That's Faust, Charles Gounod. Its premiere at the Théâtre Lyrique in Paris 19 of March 1859 It proved a dismal failure. The French public had branded the work of "tawdry" and, especially, little French. All this despite the enormous popularity at the time aroused German culture, Goethe being one of its emblems. Which itself was succeeded from the start in Germany. The adaptation of the librettists Jules Barbier and Michel Carré, He not delved into the philosophical aspects of a cult for German, and also they allowed the luxury of altering the order of importance of some characters, the play was, until not too long ago, with the title of "Marguerite". 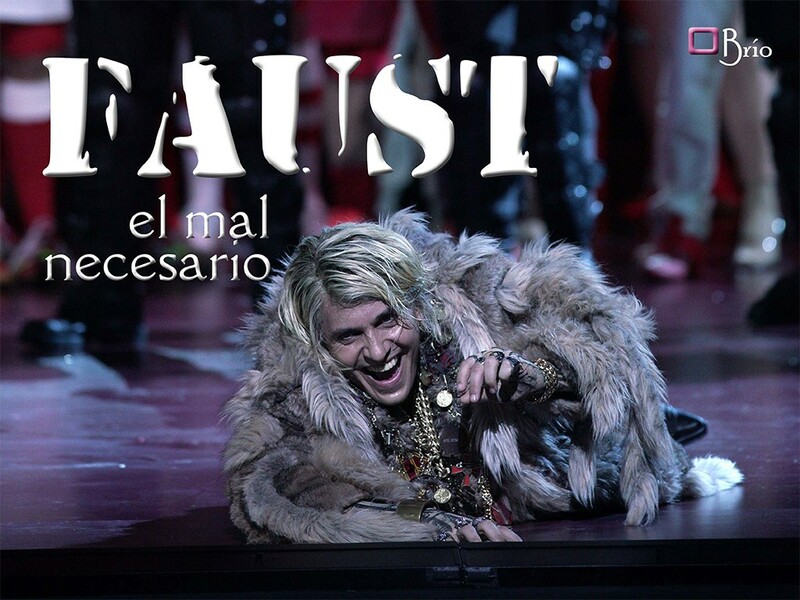 It was from its premiere in Germany when they started successes Faust. It was represented to satiety, all seasons and in almost all European theaters. Such was his popularity that, a 22 October 1883, a new theater company wanted to release his first season representing opera Faust. It was the Metropolitan Opera it is dual House.Faust. It is a French-style opera also features great German opera, as an important choir, various ballet numbers, the epic of one of his characters or the time left between numbers Gounod for the public to applaud. this detail, very Wagnerian. But back to the scenery. When it comes to La Fura dels Baus, we know beforehand that other elements like operatic voices, showmanship, even music, they will stay in the background. Sometimes this can be for good or, as in the present case, worse. 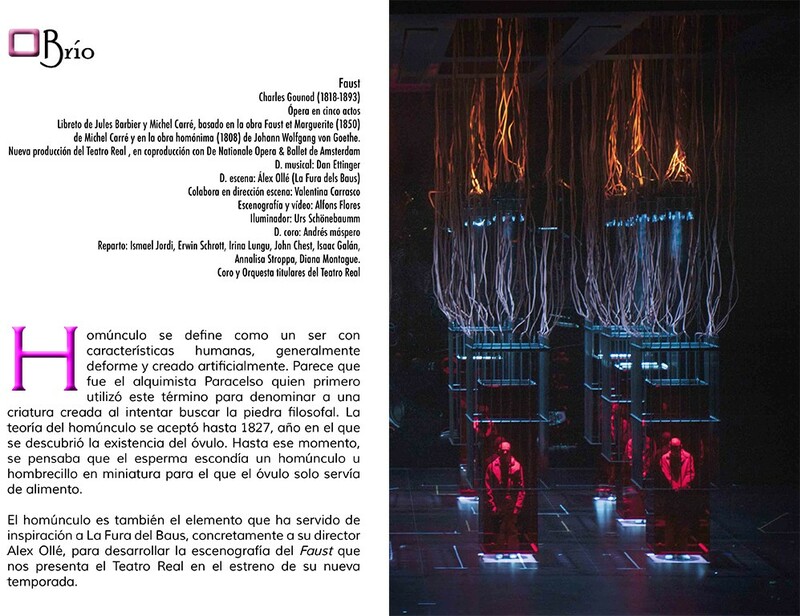 Under the homunculus project has placed the scene in a big laboratory where Faust pursues the idea of ​​inventing a computer capable of managing emotions. Frustrated and dissatisfied, accepts the offer of her alter-ego, Mephistopheles, It presented as a necessary evil, the espoleador Faust who rescues his boredom and convinces him to live everything to which he thinks he resigned so far. Mèphisto, appearing first as a rock star, camaleónica is evolving in a way to become a crucified Christ. With them, Postmodern an army of soldiers, plasticized Barbies that look naked, mature women with exaggerated breasts and hooligans with their uniforms football fans. Definitely, many conceptual elements and complex ideas that have little development or lace along the work. A stage that is full of platitudes, The usual. La Fura no longer surprising and is only able to generate controversy when the function ends and begins its shameful spectacle of pollution, completely oblivious to artistic matters. 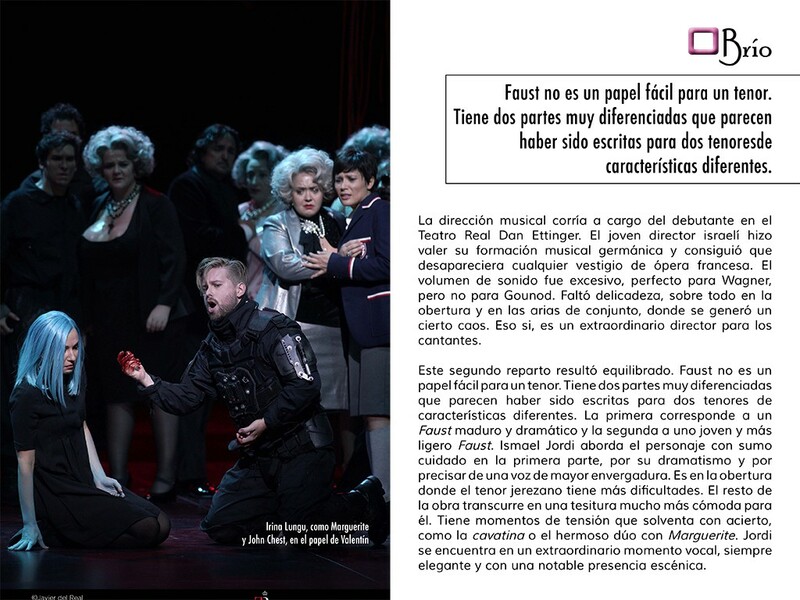 The musical direction was provided by the debutant Dan Ettinger Teatro Real. The young Israeli director asserted his Germanic musical training and managed to disappear any vestige of French opera. The sound volume was excessive, perfect for Wagner, but not for Gounod. It lacked delicacy, especially in the overture and arias set, where some chaos generated. that if, It is an extraordinary director for singers. This second distribution was balanced. Faust is not an easy role for a tenor. It has two distinct parts that seem to have been written for two tenors of different characteristics. The first is a mature and dramatic Faust and the second one young Faust lighter. Ismael Jordi addresses carefully the character in the first part, for its drama and voice require a larger. It is in the overture where the tenor has more difficulties jerezano. The rest of the play takes place in a more comfortable frame of mind for him. It has moments of tension that solves correctly, as the cavatina or the beautiful duet with Marguerite. Jordi is an extraordinary moment vowel, always elegant and with a remarkable stage presence. The Mephisto Erwin Schrott was a great theatricality, a must in this character and this production. Whenever he was on stage was the protagonist. His voice does not reach the required frame of mind for this role, but they are not easy to find baritone voices let them know. Its volume is very noticeable and pleasant timbre, but some nasal sounds a bit afearon participation. 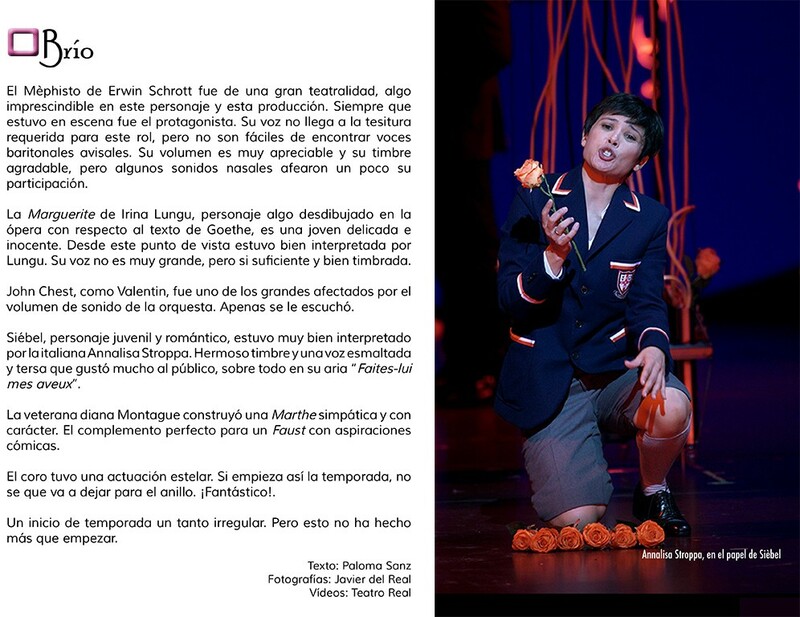 La Marguerite Irina Lungu, character in the opera somewhat blurred on the text of Goethe, It is a delicate and innocent young. From this point of view was well played by Lungu. His voice is not large, but enough and well timbrada. John Chest, as Valentin, It was one of the great volume affected by the sound of the orchestra. Just he was heard. Siebel, youthful and romantic character, It was very well played by the Italian Annalisa Stroppa. Beautiful timbre and an enameled and smooth voice that the audience liked, sobre todo en su aria "Make her my confession". The veteran target Montague built a sympathetic character and Marthe. The perfect complement to a Faust with comic aspirations. The choir had a stellar performance. If the season begins, not going to leave for the ring. Fantastic!. Initially somewhat irregular season. But this has only just begun.